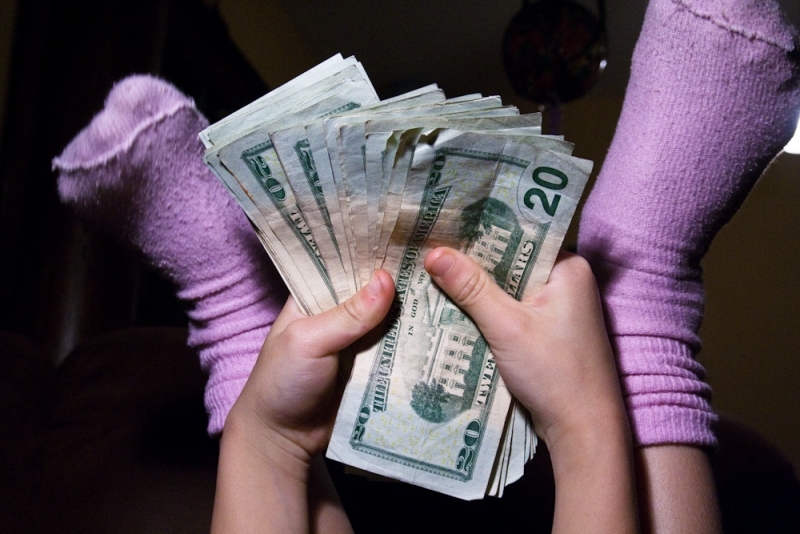 Allowance – What Should Parents Do? Many parents rightfully desire for their children to learn good financial stewardship. To help children develop a budget and learn to manage their money responsibly, many parents give their children a weekly or monthly allowance. What is a Standard Allowance These Days? A 2012 survey by the American Institute of Certified Public Accountants (AICPA) found that 61% of parents give their children allowances, most starting by the time children reach age 8. Over all age groups, allowances average $65 per month, or just over $16 per week. The average American family pays approximately 50 cents per week for each year of a child’s age. For example, a 10-year-old would get $5 per week. Another often-quoted allowance figure is $1 per week for each year of the child’s age, so an 8-year-old would receive $8 per week. Is An Allowance a Good Idea? The Bible doesn’t speak to this issue directly, so there isn’t a moral absolute here, but let us share with you our perspective. We have never given our children a regular, set allowance. The primary reason for this is that we do not want our children to develop an entitlement mentality (which is WAY too common in our society today). Many people believe that they should be given money simply because they exist. We want our children to develop a strong work ethic and to become producers in society, and not mere consumers, living off the labor of others. Because of these concerns, many parents have made the choice to link allowance to household chores. We do not do this either. Again, not a moral absolute, but we believe that being a part of the family means that everyone works together, as a team, to make the household work. We all (even the parents) have assigned tasks that we do for the love of the other members of the family. We, as parents, do not get paid to wash our own laundry, or make our own bed. This is not how finance works in the real world. We want our children to learn that if they want to get paid, in real life, they must provide a product or a service that is of value to others. If they are not producing something others want, they aren’t making money. So we do not pay our children for doing regular household chores. We encourage them to think entrepreneurially, and to find real products and/or real services for which other people, outside of our family, are willing to pay. This may include raking a lawn for a neighbor, or knitting baby blankets for sale, etc. We are blessed to have our own family business, so this is a wonderful opportunity for us to pay my children for legitimate work they do. Anything they contribute to our business, whether it is packing and shipping orders, sorting receipts for tax purposes, handing out promotional literature at events, etc., is all legitimate work that in some way, directly or indirectly, produces a real income. They are paid for all such efforts. We highly recommend that families strongly consider starting a family-run business that everyone does together, specifically for this purpose of teaching children good work habits, genuine career skills, and creating earning opportunities. It is rare that such businesses are ever able to earn enough to support the family entirely, and in most cases, a family-run business will never net as much as a paid salary from a reputable company, but whether or not the business becomes a primary means of financial support, it is invaluable in teaching skills, entrepreneurship and financial stewardship in a real-life context. One other thing for which we will pay our children are projects that we would likely hire out to an outside agency. If we would pay someone else to do this job for us, then we will pay our children. This will look different for every family, but for us, things like lawn maintenance, snow removal, small household repairs (for the older teens), cleaning leaves from low hanging gutters in the fall, etc., are all opportunities for us to fund our children (again, usually teens) instead of paying someone outside of our family. Regardless of whether you agree with our model or not, we hope that you will teach your children to budget, save and give, realizing that the money we receive, as Christians, does not ultimately belong to us, but to God. We are His managers or stewards, and we need to spend His money only as He wants us to. Money is a great servant, but a terrible master. Check out these money management tools for children, and set them on the road for sound financial management in their younger years, so they can be successful in the years to come. Israel Wayne is an author and conference speaker. He is author of the books, Full-Time Parenting: A Guide to Family-Based Discipleship, and Pitchin’ a Fit: Overcoming Angry and Stressed-Out Parenting. He is the Director of Family Renewal, LLC. I see your point about not paying kids for what they should normally do as part of the family (household chores). Our kids have daily chores they do….but we have moved to a $5 per week allowance, so that they can learn to give, save, and spend wisely. When they are older and can do more that would be a service to others (mow lawns, etc.) that might change, but we wanted to start the financial stewardship lessons earlier than that. We tell them they need to put $1 in each of the 3 jars (give, save, spend) but can put the other 2 in their choice. They get excited about the giving part, and usually choose the offering plate. When our church was sending a team on a mission trip, one of them excitedly asked if they could give “more” to the trip. We also have seen them spend their “spending money” on toys that break….and things that don’t last…and then they reflect on the “waste of money it was”. (Lesson learned). Couponing and sale watching comes into play with their spending as well. I am amazed at how often they choose to spend their “spending money” on each other, or special things to share. We dream of someday having a home business (that they could take part in) but for now we do some hobby beekeeping and they help with that, and the selling of the honey etc. A neat thing is they were asked to give a presentation for homeschoolers at our library (and paid for their time.) It went so well that they have been asked to do a second one there for the community. All in all I agree, kids need to be taught financial stewardship, and that it all comes from (and still belongs to) the Lord. Education – Does God Have an Opinion? © 2014 Family Renewal Ministries. All Rights Reserved.